If you’ve been to my house, which you probably have not, you’d know I have a loft space that is in dire need of some decor (design board here). Well the first step in that process was a small, but very important step. The top of my stairs. 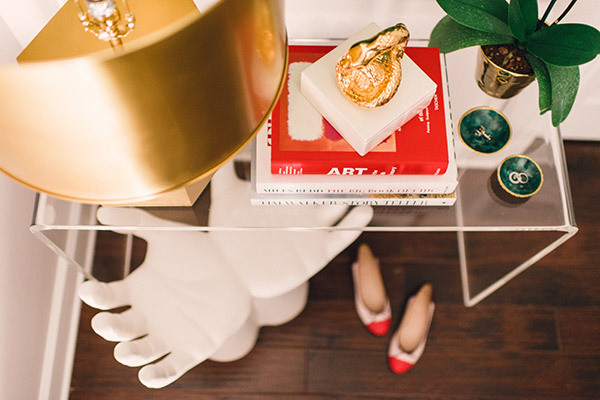 This tiny space was just begging for a console table, a grand piece of art and a little bit of styling. And while these pictures make this area look very pristine it’s actually quite functional. And functionality is something I believe every space should have. For example, that quirky hand stool can actually be sat on, but normally houses my purse or anything I don’t want to forget when leaving in the morning. 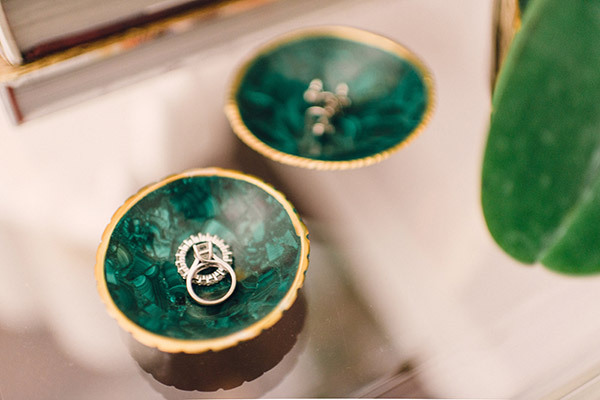 Another act of functionality, the snake box and malachite bowls which double as beautiful accents plus places to stash my stuff. I’m notorious for having jewelry and trinkets in every feasible place and in every single room so shouldn’t they at least be beautiful? Next for adding height to the console table, because you never want everything on one plane, I utilized coffee table books which I collect and use whenever I can. Plus that pop of red was a necessity. Last year I saw Kathryn Ireland speak at Americas Mart and she said that no room is complete without red as it always warms up the space. Being someone who doesn’t use red liberally (or really ever) I was hesitant when I started integrating red into my rooms, but dang it if she wasn’t right. Even a dash of red, as in this case with the Art book, automatically adds that small touch of warmth where this space could have felt a tad cold. And while the show stopping Mary McDonald table lamp needs no explanation, it actually serves the purpose of light and isn’t just a beautiful accent. You see my loft is very dark, there’s no windows so no natural light. Which is quite different than what you naturally think of when you think loft. But it is what it is. So when decorating I knew I needed to have a lamp that actually gave off some light and I promise you she gives off some serious shine. I love the pops of red and that snake box is amazing! Seriously chic! Please put your loft on AirBnB so I can come experience it! I’m CRAZY about this!! Well done:) If I were you, I think I’d just sit in this area all day and beam. The styling is impeccable. Such a chic little space! 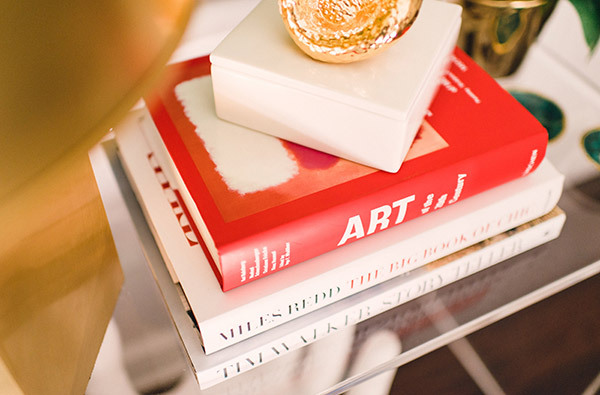 That lucite table is too perfect. I adore the painting in this foyer and the gold accents. Gorgeous photos. That snake trinket box is a must have. Love it! Absolutely love! 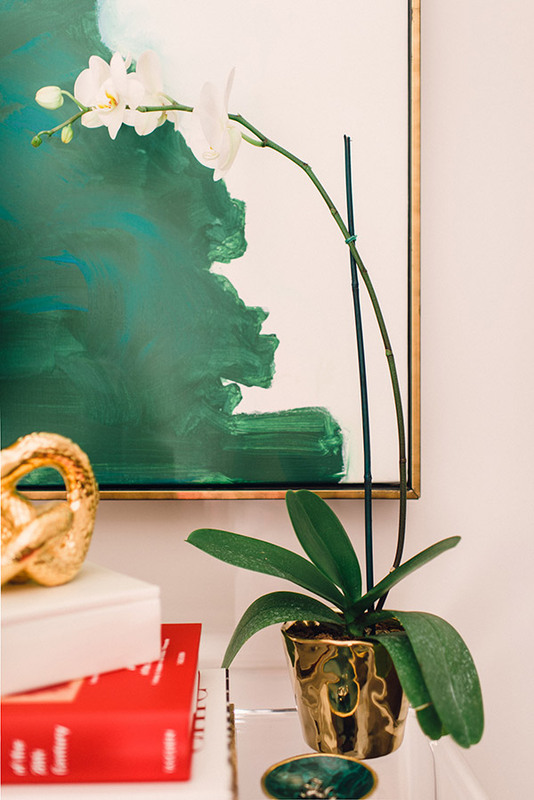 Great to see a strong gorgeous emerald, I am obsessed with the Art Deco feeling it brings to any space. I’ve loved those bowls for so long but thought they were pricey for something so little. But you make them look like such a big impact. I think I need to finally get one!! What about the painting? It’s stunning! 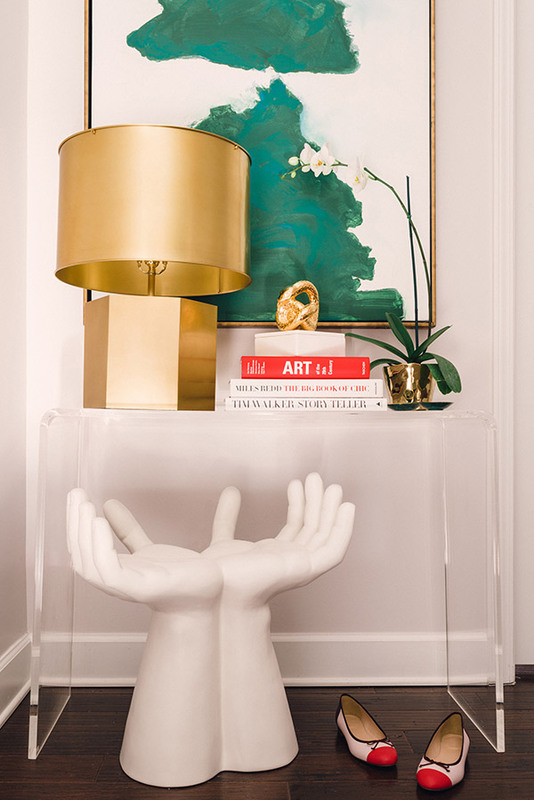 Love the Lucite table and Malachite bowls. Great post. It looks fantastic! Can’t wait to see the hand stool in the store. I LURVE the art as well, and good Lord you are one lucky beotch to have that Mary Mc lamp. I am obsessed with that painting…where did you find it??? So lovely! I will be checking out that hand stool, the gold planter and I would also love details on that fabulous painting! also want the deets on the awesome painting! love your whole set up. I also dont use red normally (or even wear red) but I added some on my art wall, and it makes all the difference! 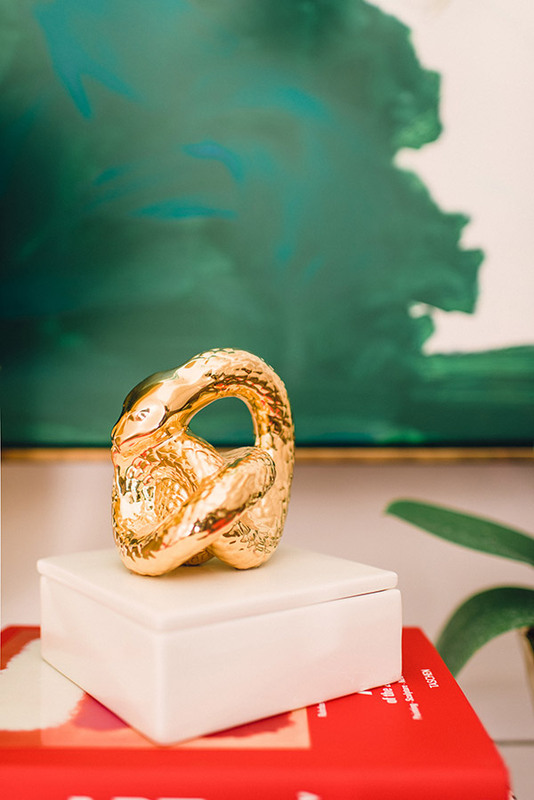 I love the whole vignette, but my favorites are your snake box and the artwork. Please share details on the art! Amazing…. The hand stool …. Must have please email when it becomes available! Could you please email me info on the painting? Love it! The hand stool is the best! !I need to know more about it. My theme in the living room is hands. I’d love to know about the painting! I love it!!! Maybe I missed it- but who made this amazing piece if art? I LOVE this painting I just cannot get enough. I cannot seem to find a link is this still available? I need that painting ! LOL! Did anyone find it? absolutely kicking myself for not picking up those emerald artworks when i spied them on chairish just before christmas! this one looks so fabulous here! did you pick up the pair? I’d love to know where you got the painting and if it came framed. It’s gorgeous!!! I need that painting! Did you ever find out where it was from or the artists name?